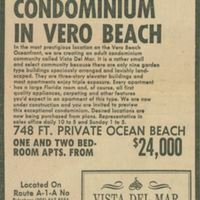 A newspaper advertisement for Vista Del Mar, an oceanfront adult condominium located at 5400 Florida State Road A1A in Vero Beach, Florida. According to the ad, which was published in 1974, real estate developers were planning an adult condo community with nine three-story, garden-type buildings. A 748-foot one- and two-bedroom apartments ranged from $24,000. Original newspaper advertisement, 1974: Oviedo Historical Society, Downtown Oviedo, Florida. Digital reproduction of Original newspaper advertisement, 1974. Oviedo Historical Society, Downtown Oviedo, Florida. Vero Beach Collection, Indian River County Collection, RICHES of Central Florida. Converse, C. "Tim" Vaughn. "OUR TOWN." The Town of Indian River Shores, Florida. http://www.irshores.com/Town-History.html. 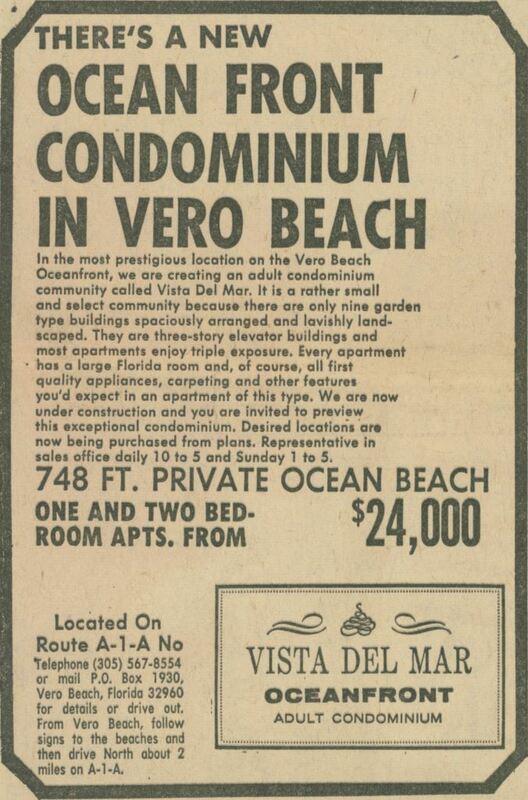 “Vista Del Mar Advertisement.” RICHES of Central Florida accessed April 22, 2019, https://richesmi.cah.ucf.edu/omeka/items/show/5623.